Can you fangirl over a 10 year old? 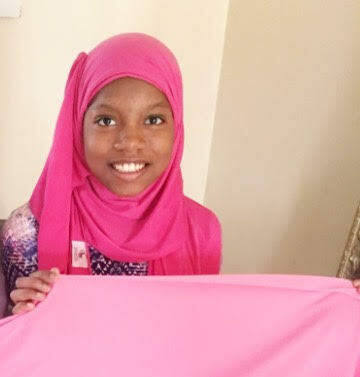 Because I am a total fan of this amazing 10-year-old entrepreneur who launched Hijabi Fits, a hijab company for teens and tweens. In this time and age, many tweens and teens are all over social media doing the usual: taking selfies, playing around with filters and taking pictures of their cars. But Amaya Diggins is something else. Read our interview down below with Amaya and her mother, Ameena. Muslim Girl: What is your full name, how old are you, and what state are you from? Amaya Diggins: My name is Amaya Diggins, I am 10 years old, I will be 11 in 2 weeks! I am from New Jersey! Can you briefly tell our readers what Hijabi Fits is? Hijabi Fits is the perfect size Hijab for tweens and teens. Made by a tween. No more “too big” hijabs. My hijabs come in fun colors to match our outfits. They are not in grown up colors or prints. Which hijab is your favorite from Hijabi Fits? I really want to have my Hijabi Fits hijabs sold in Justice, so if anyone has any contacts please let me know, that would be amazing! I also want to have all the Islamic schools here in America to have Hijabi Fits be the hijabs they choose for the girls at school. Do you think this will encourage young girls your age to wear the hijab and be more confident in doing so? I pray so, I want all girls to know Hijabi Fits is for them — hijabs made by a tween and teen and they can feel excited about wearing Hijab and be confident and cute. How do you feel having such a strong, beautiful and intelligent young daughter who is making history? Ameena Diggins (mother): Amaya told my dad when she was eight that she wanted to change the world. She didn’t say how or when, but it seems she is off to a good start, mashallah. I am a firm believer that representation matters! Positive representation matters right now! Our children need to know that their parents and the larger community have their back. It didn’t dawn on me that she is making history until today, when I got our local paper and she made the front page or being featured on Good Day Philadelphia. South Jersey Magazine choose her for their Girl Power as Girl of the month. I scrolled back to see the other amazing girls they featured, but it seems not only is Amaya the first Muslim girl, she is also the first African American girl featured as well. My husband and I are extremely proud of Amaya for going for her dreams. She has a very positive outlook on life. I want to encourage and support her as far as her dreams can take her. Is there anything else the both of you would like to add? Amaya Diggins: Go to Launchgood.com/HijabiFits or HijabiFits.com to support the next generation of American Muslims. Muslim Girl recently gave a journalism/interviewing workshop at a local middle school and we had the students write down their questions to Amaya as well, to be part of this history in making. Yes! I am planning to offer print hijabs and different color hijabs as well. I am excited about the new colors. Yara and Yazda Ramadan: What inspired you to wear the hijab? Well, I had been practicing to wear it. My friends wear hijab and my older cousins wear Hijab and my mom and Masjid classes told me about being modest. It just seemed like the right thing. Sundus Mustapha and Khalid Hamdan: What makes your hijabs different than the other ones out there? My mom bought me a ton of scarves. If you see some of my older pictures, I look a hot mess. The scarves were too big and bulky, and most are in darker colors. It was too hard to find Hijabs that fit just right. I got tired of stuffing fabric down my shirt or tying knots. Who can not be a fan of this brilliant tween? Support her today and purchase her hijab here. Best of luck, Amaya and inshAllah, this new business of yours will continue to grow and be successful.